It wasn't intentional to hit up two Thai chains this weekend. 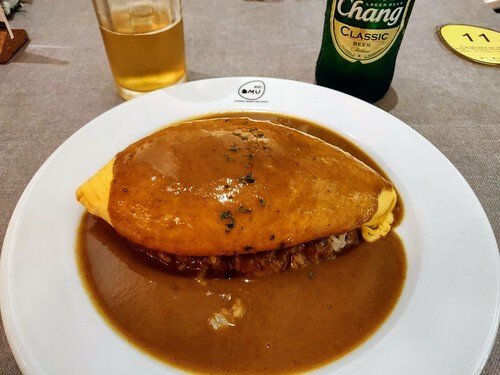 We just happened to be at Suntec City when we figured that this Japanese omurice place from Bangkok would make for an easy dinner (3 Temasek Boulevard #01-301, 9834-0079). They offered several different sauces; I went for curry, which certainly wasn't anything as exciting as Coco Ichibanya (and it wasn't as cheap as I thought it would be either). But they offered a "lava-style" option here, leaving the egg cooked halfway on one side so that it's creamy and oozing when you cut into it.